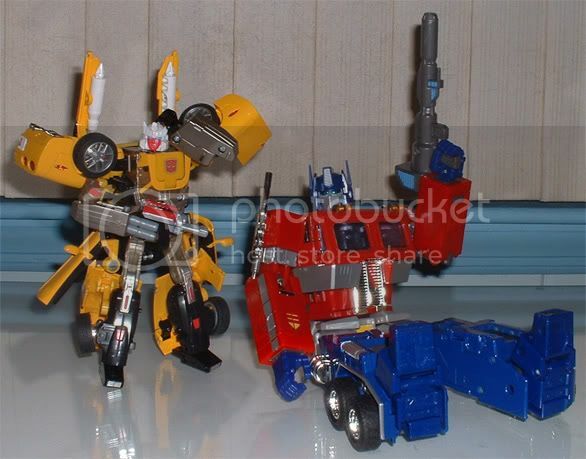 Discussion in 'Transformers Collection Showcase' started by Primevil, Jun 22, 2005. So I finally decided it's about damn time I start taking pictures of my collection. And where did I decide to start? 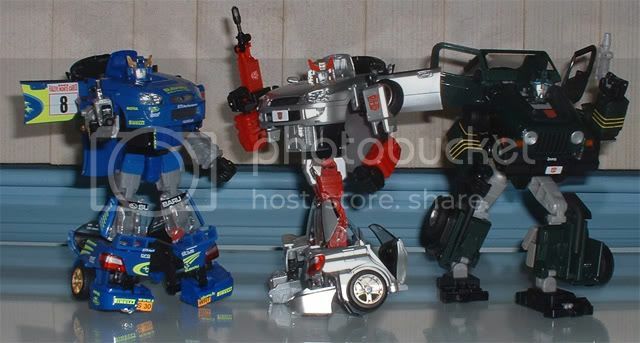 Where it was easiest: Alternators. 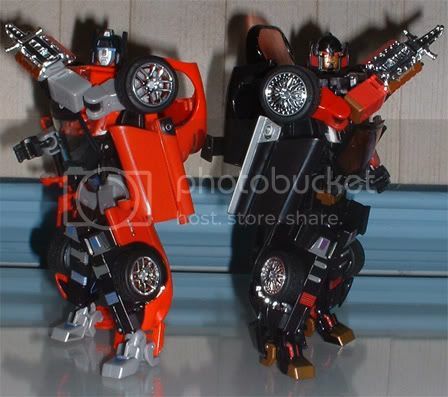 Sideswipe and Dead End, with their symbolic mirrored poses. Why is Tracks confused? Because he's my only BT, and Convoy is being very casual. The reason he's sitting is so the pic looks more vertically balance (than if he were standing), and because I wanted to have some fun with this pic. 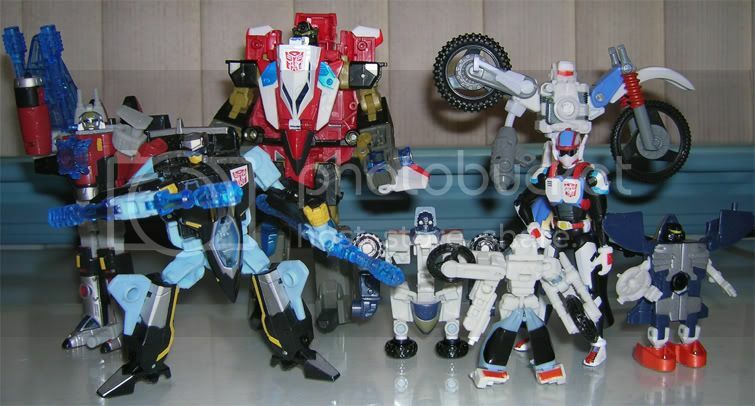 And here we have the Alternators that ended my year-long boycott (so to speak) of the line: Tracks, "Overdrive", Shockwave, and Prowl. 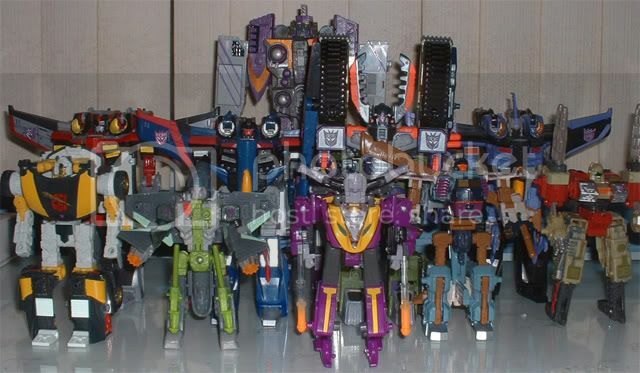 Tantrum, Rampage, Razorclaw, Divebomb, Headstrong (Takara reissues); Thundercracker (CSIII reissue), and Blitzwing (vintage). 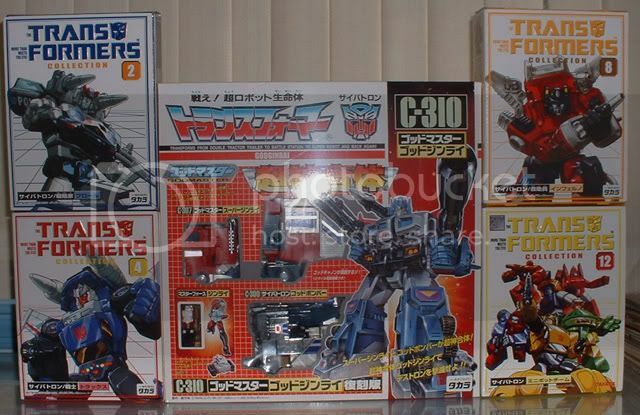 Thundercracker has no box because I bought him on eBay loose with CSIII Bluestreak. 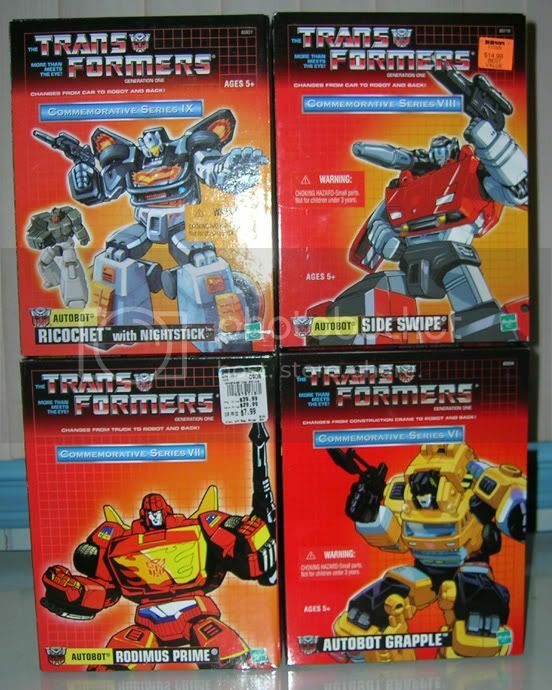 Starscream, Skywarp, Dirge, and Megatron (all reissues, obviously). Not MISB, I just keep them in their boxes when I'm not playing with them. I like the way you posed Side Swipe and Dead End. I really like the picture of Tracks and OP. 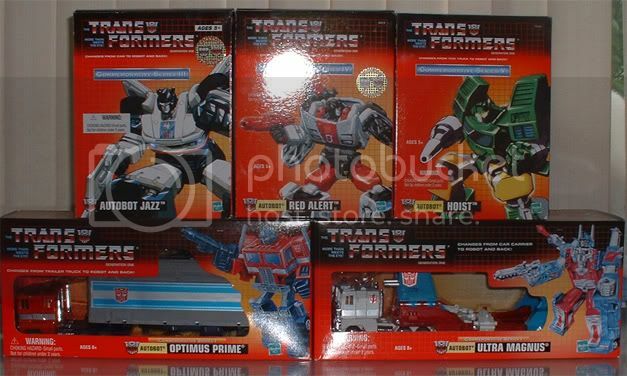 To me Prime seems rather intoxicated. Part 2 is right behind. I'm not sure where I'm going next. 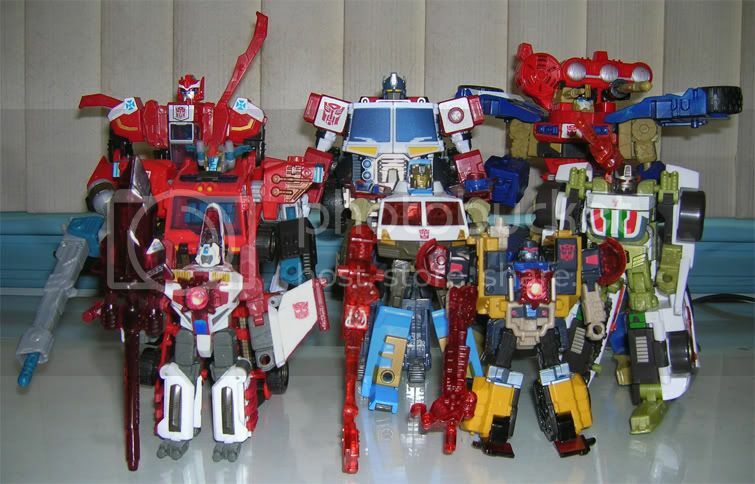 Could be Beast Era, RiD, Universe, Energon, or miscellaneous collectible figures. 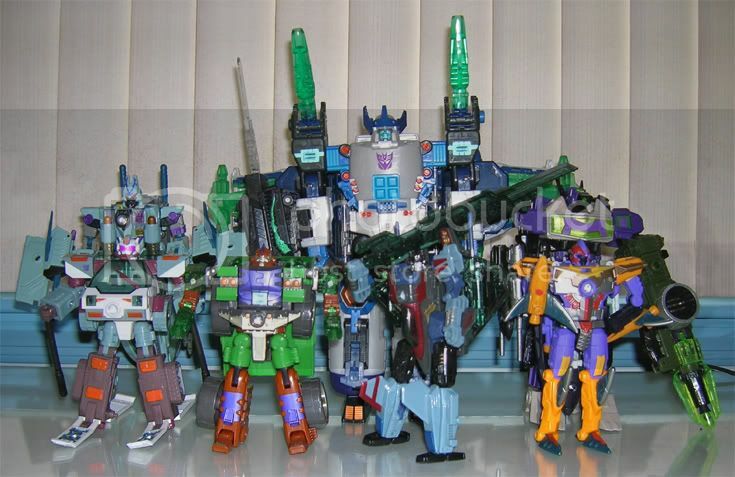 And I've changed the picture of my loose G1 Decepticons. 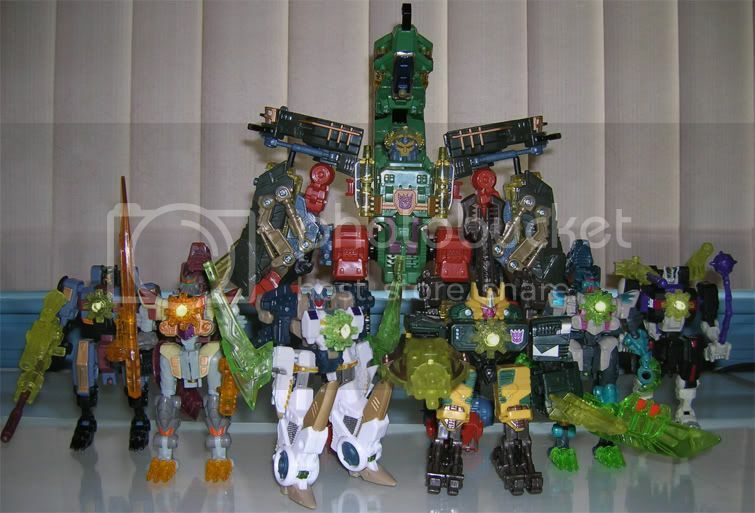 I decided to separate the Predacons because I'm putting Gestalts into a picture together. 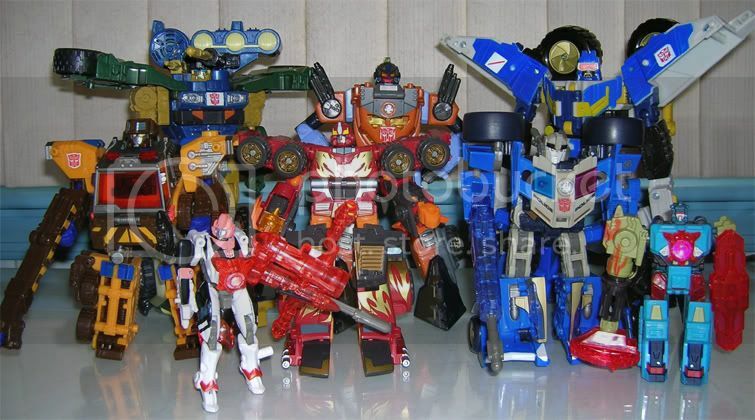 Ah here are the Armada toys you had a blast playing with. 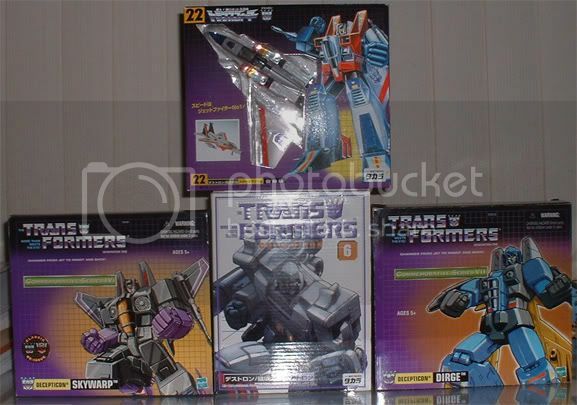 I bought Skywarp and Thundercracker on ebay, can't wait for them to arrive. Love your arrangements man. Good stuff. nice collection! Love the reissues! I added two pics to my earlier posts to keep the different lines together (because I can be a bit detail-oriented at times). 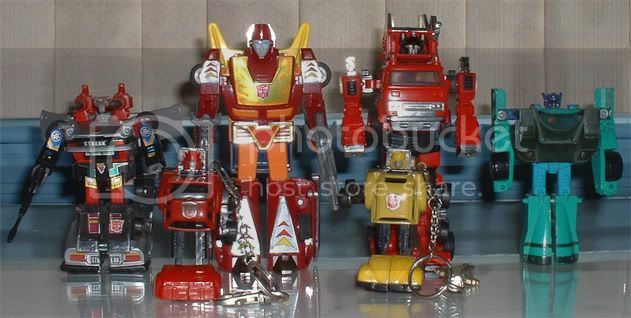 It's just a couple of Alternators and some G1 reissues. Looking good. But BRING ON THE BEASTS!!! Wow, I've been seriously neglecting my collection showcase. It's been ages since I even took pictures. Why I didn't take any last week when I was home for Spring Break, I have no idea. I'll have some serious catching up to do when I go home for the summer. 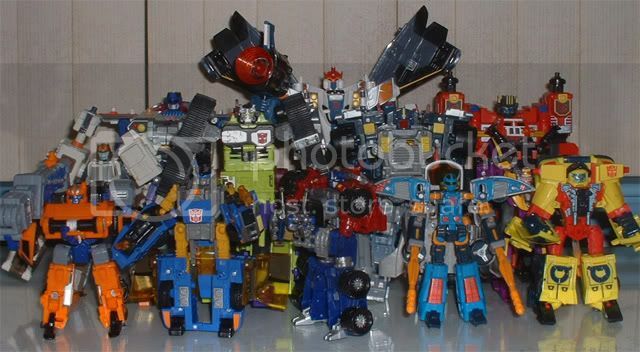 But in the meantime, here's my Energon collection. 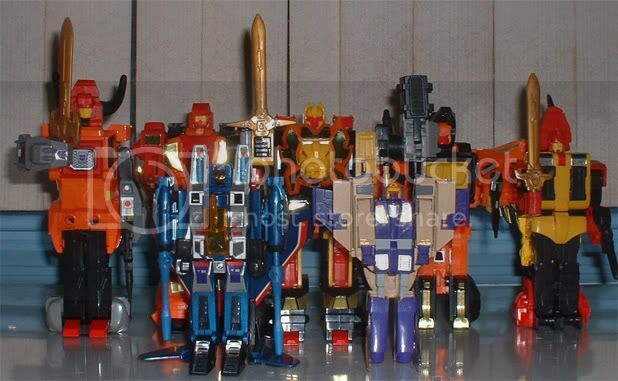 Unfortunately, I just realized that I managed to leave out my 3 Micron Booster figures. Oh well, I can throw them in with my Universe figures when I get to taking pics of them. 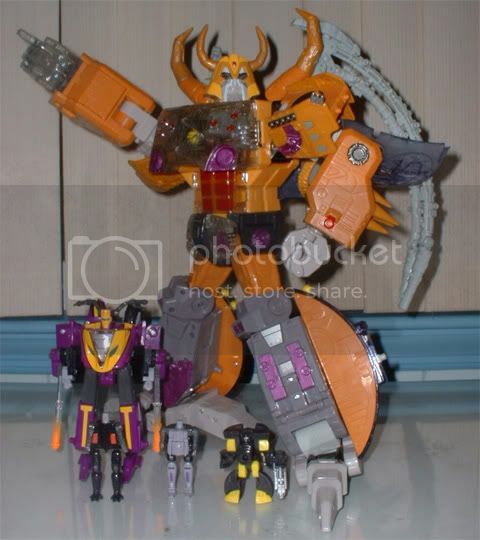 As for the lack of Beasts, I've been putting them off until I complete the Beast Wars 10th line, something that's taken a heck of a lot longer than I planned (still have to get Rattrap, Dinobot, Transmutate, and both versions of Primal and Megatron), but I might just take pics of what I have when I go home in June.